GOODBYE plastic straws, hello environment. Faith Lutheran College has proved they are leading the way in environmentally friendly practices impressing Opposition spokesperson for Environment David Crisafulli with its initiatives. Environmental consciousness had been a consideration of the school for many years but its 2018 Serve and Preserve mantra has influenced the school to go from strength to strength. The opposition spokesperson said he was blown away by the environmental practices implemented when he visited the school. 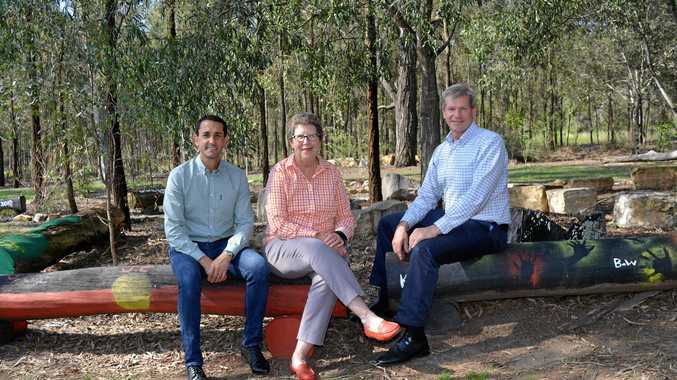 "This school just proves that regional Queensland want to do the right thing and the next generation want to do the right thing,” Mr Crisafulli said. Presently, the Plainland facility uses solar panels, water tanks and environmentally friendly buses to reduce its carbon footprint. Mr Crisafulli used the trip as research and background into people living in country communities who "live sustainability every day”. "We can get fooled into thinking the only people that care about the environment are people who live in inner city Brisbane and throw themselves in front of bulldozers,” he said. Faith students work with staff to ensure the school is as environmentally friendly as possible and as a result the school no longer purchased straws. School principal Janelle Anderson said the students took on the environmental challenge enthusiastically making it a great success. "We've got a student doing calculations on what we've actually saved financially and what it will be for saving for the environment,” Mrs Anderson said. "The students are coming to us with suggestions of how we can be more environmentally friendly and change practices at the school." The school also have a green approach to transportation, owning a fleet of 13 buses with an emission filtration process which converts emissions into water. Member for Lockyer Jim McDonald said the school did a wonderful job at preparing children for life. "The great thing is that it's an organic process and the students are doing the learning,” Mr McDonald said. A new gymnasium scheduled for construction at the school in 2019 will fit in with their environmental approach. "We will have solar panels all over the roof of the gymnasium which will power at least that facility so it can run into the evening, we've got batteries to store the energy and it'll be self-contained facility,” Mrs Anderson said. She said plans for the school included worm farms, compost and an environmental corridor of trees providing privacy from the highway.